The portable printer is designed to function with near zero-waste and to work under unpredictable constraints (limited water, power, and labor infrastructure) to tackle housing shortages in underserved communities throughout the world. New Story’s goal for this project is to print the first community of homes for underserved families in El Salvador in the coming 18 months, and then through partnerships, scale up production to serve additional communities over the next few years. Housing will feature cutting-edge materials tested to the most recognized standards of safety, comfort and resiliency. More than just New Story using the technology to reach more families, the hope is that this catalytic R&D project that will influence the sector as a whole. Through the technology, the team will learn, iterate, and then share the technology with other nonprofits and governments to help everyone improve and reach families faster. The high-powered innovators behind ICON and the first global initiative with New Story include a cross section of engineers, environmentalists, designers and entrepreneurs. ICON and New Story worked in close partnership with several other organizations to develop the Vulcan printer including Pump Studios, Yaskawa Electric, Alchemy Builders, TreeHouse, Andrew Logan Architecture, Linestar Automation and The University of Texas. ICON is a construction technologies company dedicated to revolutionizing homebuilding. Through their proprietary 3D printing technology and cutting-edge materials, ICON provides sustainable solutions to a number of our world’s most pressing issues, including the pandemic of homelessness in the developing world, the difficulty of constructing off-planet space habitats, and the exorbitant cost of customized housing. 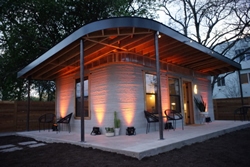 ICON has recently built the first permitted, 3D-printed home in America in partnership with the non-profit New Story, and is working with them to create a mobile printer for the developing world that has the ability to print a single story, 600-800 square foot home in under 24 hours for less than $4000. As a part of that effort, ICON has developed cutting-edge materials tested to the most recognized standards of safety, comfort and resiliency and is designed to function with nearly zero waste production methods and work under unpredictable constraints (limited water, power, and labor infrastructure) to tackle housing shortages. For more information, visit https://iconbuild.com/ or follow on Instagram and Twitter @ICON3DTech.